Mexico is pressing ahead with a controversial plan to extend a rail network into the heartland of the indigenous Maya culture by announcing a series of tenders. 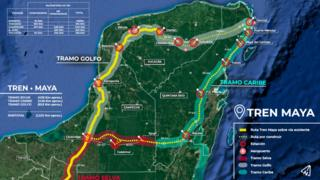 He says the 1,525-km (950-mile) project through Quintana Roo, Tabasco, Campeche, Chiapas and Yucatán states has to be ready in 2023, and the first tier of tenders this year should link sections of track from Chiapas to Yucatán. The second stage next year will extend the route to the major Caribbean resort of Cancún via Chichén Itzá, one of the most important Maya archaeological complexes and a UNESCO World Heritage Site. The project aims to kickstart development in the peninsula through a boost to tourism, but it came under criticism from environmentalists and Maya rights campaigners even before it was launched in December. Since then, the government has been at pains not only to trumpet the "hundreds of thousands of jobs" that President Andrés Manuel López Obrador says Maya Train should bring the region, but also to burnish its ecological credentials and try to win over local communities. Mr Jiménez Pons told reporters that there will be no underground tunnelling work, "due to the unstable terrain" of the earthquake-prone peninsula, and President López Obrador along with other officials has taken part in traditional Maya ceremonies to "seek permission of Mother Earth" to proceed with the project. One of the most high-profile announcements came from the mayor of Mexico City, Claudia Sheinbaum, who said all federal funding for the Mexican Grand Prix will be diverted to the Maya Train project, which will use emissions-free locomotives. And last month the government said finances intended for ProMexico, the foreign trade board that President López Obrador has shut down, will also go to Maya Train, leaving embassies to pick up the work of promoting exports. These steps have led to an unusual alignment between the campaigners and Gustavo De Hoyos Walther, the head of the Coparmex employers' confederation. He deplored the closure of ProMexico, and warned that the "government's all-or-nothing wager on Maya Train is almost suicidal,"
Environmentalists are standing by their objections to driving the rail network through the UN-designated Calakmul Biosphere Reserve, the second-largest expanse of tropical forest in the Americas, after the Amazon. It is also the natural habitat of endangered jaguars, prompting Aarón Rosado Castillo, who is in charge of the Yucatan section of Maya Train, to promise to work with the National Jaguar Protection Association to "minimise the impact on their habitat". But the future of the project is likely to depend on the Maya people themselves, who under Mexican law must give their consent before developments of this scale can go ahead on their ancestral land. Mr Rosado Castillo says that "our chief message is that everyone can get aboard this train, as we are designing it together". He clarified that this amounts to consultations with the National Institute of Indigenous Peoples government agency over the next 12 months, and there is no guarantee that local communities will accept the outcome. One major Maya group, the EZLN Zapatista anarcho-socialists, have already warned the government that they will oppose "the big capitalists' mega-projects, including the Maya Train... because these projects mean destruction". This could give the authorities pause for thought. The last time the Zapatistas took exception to central government policies back in the 1990s, they seized control of large areas of Chiapas State.